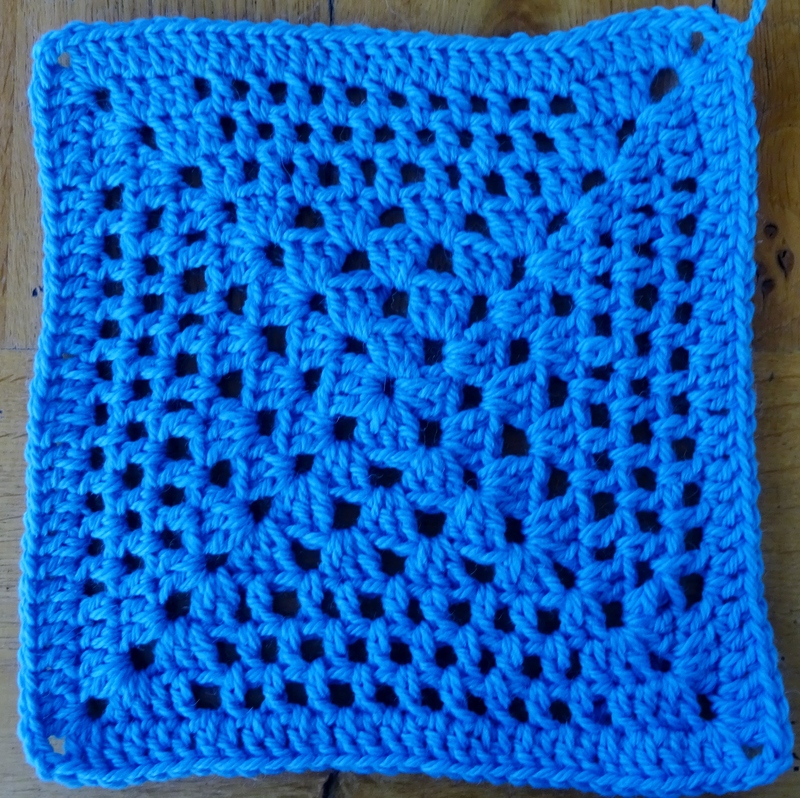 Look closely and you will see the first 4 rounds are a normal granny square, so this should be a quick one for you to make. I made my squares from one colour throughout, but if you want to change colours then simply join your new colour at the point you do a ss on each new round. Round 3: ss into 2ch-sp, 5ch (counts as 1tr, 2ch), (3tr, 1ch) into the same 2ch-sp, *(3tr, 1 ch) into the next 1ch-sp, (3tr, 2ch, 3tr, 1ch) into the next 2ch-sp; repeat from * twice more, (3tr, 1ch) in next 1ch-sp, 2tr into the first 2ch-sp, join to 3rd st of starting 5 ch with a ss. Round 4: ss into 2ch-sp, 5ch (counts as 1tr, 2ch), (3tr, 1ch) into the same 2ch-sp, *(3tr, 1 ch) into each of the next 2 1ch-sps, (3tr, 2ch, 3tr, 1ch) into the next 2ch-sp; repeat from * twice more, (3tr, 1ch) into each of the next 2 1ch-sps, 2tr into the first 2ch-sp, join to 3rd st of starting 5 ch with a ss. Round 5: ss into 2ch-sp, 5ch (counts as 1tr, 2ch), 2tr into the same 2ch-sp, 1ch, *(miss 1 st, 1tr in next st, 1ch, miss 1 st, 1tr in next 1ch-sp, 1ch) 3 times, miss 1 st, 1tr in next st, miss 1 st, 1ch, (2tr, 2ch, 2tr, 1ch) in next 2ch-sp; repeat from * twice more, (miss 1 st, 1tr in next st, 1ch, miss 1 st, 1tr in next 1ch-sp, 1ch) 3 times, miss 1 st, 1tr in next st, miss 1 st, 1tr in first 2ch-sp, join to 3rd st of starting 5ch with a ss. Round 6: ss into 2ch-sp, 5ch (counts as 1tr, 2ch), 2tr into the same 2ch-sp, *1tr in next st, 1ch, (1tr, 1ch) in each 1ch-sp up to the 2tr just before the next corner, miss 1 st, 1tr in next st, (2tr, 2ch, 2tr) in next 2ch-sp; repeat from * twice more, 1tr in next st, 1ch, (1tr, 1ch) in each 1ch-sp up to the 2tr just before the next corner, miss 1 st, 1tr in next st, 1tr in first 2ch-sp, join to 3rd st of starting 5ch with a ss. Round 7: ss into 2ch-sp, 5ch (counts as 1tr, 2ch), 2tr into the same 2ch-sp, *1tr in each of next 2 sts, 1ch, (1tr, 1ch) in each 1ch-sp up to the 3tr just before the next corner, miss 1 st, 1tr in each of next 2 sts, (2tr, 2ch, 2tr) in next 2ch-sp; repeat from * twice more, 1tr in each of next 2 sts, 1ch, (1tr, 1ch) in each 1ch-sp up to the 3tr just before the next corner, miss 1 st, 1tr in each of next 2 sts, 1tr in first 2ch-sp, join to 3rd st of starting 5ch with a ss. I made 3 of these in different colours, but you could do 4 or 5 if you prefer. Please keep sharing progress on my Ravelry forum.